ZA 16/15699 of Leon Venter won the club race by 26 minutes. Speed 1192mpm. 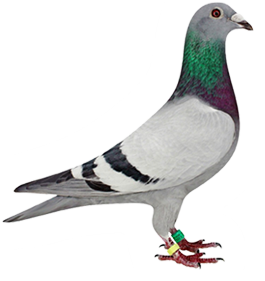 15699 also won the BPK Fed against 617 pigeons, was 7th NRHU against 1414 pigeons and 16th WCPTA against 3219 pigeons. This was not her first good race. She previously won 3rd club 14th NRHU 2010 pigeons 22 WCPTA Laingsburg 220km 1442mpm 5042 pigeons. FATHER: "77" - son of BLIKSEM 16734 x 40147 (daughter WITTENBUIK 370). "77" is a full brother of POCKET POWER, winner of two Combines in 2015 against 5252 and 6208 pigeons. "77" is also a winner. He won 1st club (3 minutes) and 6th Pretoria Combine Richmond 760km 1136mpm 1406 pigeons. MOTHER: ZA 13/16850 - daughter of BANGE BLIKSEM x LADY COOLS.